﻿ Portwell Announces WEBS-5481-S, a leading-edge Fan-less Box PC and exclusive entry-level high-end System based on Intel® Haswell ULT SoC- Portwell, Inc.
Portwell Inc., (http://www.portwell.com.tw) a world-leading innovator in the Industrial PC (IPC) market and a Premier member of Intel® Internet of Things (IoT) Solutions Alliance, has been dedicated and determined to develop trustable IPC innovation systems with inherent high reliability. Today, Portwell proudly announces the modernized WEBS-5481-S, a high performance and low power Box PC system with rugged fan-less design, powered by the mobile 4th generation Intel® Core™ ULT (ultra low TDP) SoC (system on chip) processor (formerly codenamed Haswell). The intelligent WEBS-5481-S system supports triple display with high-resolution and provides wireless function. This makes it an ideal platform for high-performance, high-demanding video/graphic and automation controlling applications to expand the market in IoT world. Earlier in 2014, Portwell announced the WEBS-5400 series. Based on Intel Haswell ULT SoC platform, the WEBS-5400 series focuses on rugged fan-less design and high-resolution graphic performance. The embedded ultra-low power system series with Intel Core i7/i5/i3 processor supports triple-display and dual-core technology speeds up to 2.5 GHz while maintaining an enviably low power consumption and powerful computing ability. As an essentially slimmed-down version of WEBS-5481, the new WEBS-5481-S is the most elaborate entry-level Box PC of the WEBS-5400 system series. WEBS-5481-S is powerful but not power hungry. This is because of its ability to utilize the dual-core 4th generation Intel Core processor with Intel Turbo Boost Technology 2.0 (select CPU SKUs), Intel Hyper-Threading Technology and Enhanced Intel SpeedStep® Technology. The integration of Intel's Haswell SoC of mobile 2-in-1 platform combined with only 15W TDP design, enables WEBS-5481-S to incorporate a more effective thermal design into a smaller, sleeker and lighter intelligent system than ever before. Another high-light of WEBS-5481-S is the triple display that supports the high-resolution video/graphic capability. This allows the new Box PC to take full advantage of the 4th generation Intel Core processor with integrated HD4400 graphics engine, which outperforms its predecessor by over 20 percent. One other specialty is that the progressive mechanical design concept enables WEBS-5481-S to stand out from the pack in hash environments. It is also compact, rugged and fan-less. With a highly reliable thermally-enhanced ripple fin chassis design, WEBS-5481-S functions reliably in operating temperatures ranging from -20 to 55°C. It has also passed both an anti-vibration test of up to 5Grms and an anti-shock test of 50G. The versatile WEBS-5481-S system supports many other major features, including dual channel DDR3L memory up to 16GB, one 2.5" SATA HDD/SSD, one CFEX, one mSATA for storage. 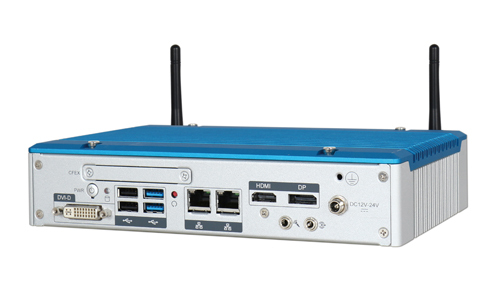 It offers rich compact I/O sets and fast connectivity functions with three independent display interfaces (VGA/HDMI/DisplayPort), two COM ports (one RS-232/422/485 port by BIOS selection and one RS-232 port), two USB 3.0 and two USB 2.0 ports, two Gigabit Ethernet ports, one 8 bits GPIO port, and Line-out/Mic-in Audio interfaces. Furthermore, in the Industry 4.0 generation, networking plays a major role in IoT world. To enhance the system flexibility, the optional WiFi or 3G/GPS mini PCIe module is offered via one full-size mini PCIe socket with an onboard cover type SIM card holder and one half-size mini PCIe socket to process data transferring from local wireless network or mobile phone base station. Moreover, to assure solidity and reliability, Portwell's WEBS-5481-S has not only passed both vibration and shock tests and supports a wide operating temperature range, but it also supports a wide range of DC power input from 12V to 24V, all in a compact design that weighs a mere 2 Kg. WEBS-5481-S's flexibility makes it the appropriate choice in a variety of situations to expand the application fields. As an incredible intelligent compact system, WEBS-5481-S has proven itself to be a perfect solution for video/graphic high-demanding applications, also for a variety of market segments such as retail, medical, digital security surveillance, and factory and industry automation. The WEBS-5481-S, a downward/slim version of WEBS-5400 series design concept, builds on Intel® Haswell ULT Low Power SoC and takes advantages of Intel® Core™ mobile processor technologies that can support dual channel DDR3L memory. Support two Gigabit Ethernet ports and two Mini-PCIe sockets. The WEBS-5481-S is an ideal platform with HD graphic output for POS, kiosk, digital signage and transportation applications.